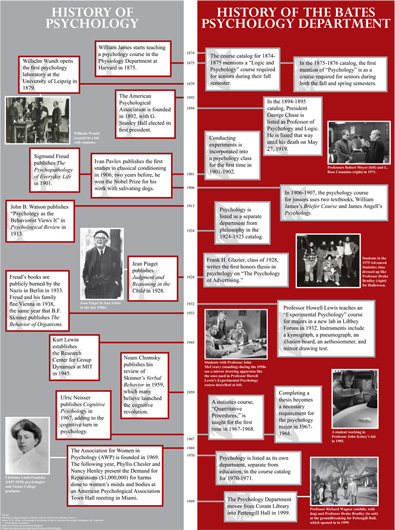 Below is the beginning of a timeline about the history of psychology, both a history of the field as a whole and a history of the field at Bates. Four students (Helen Chyz ’14, Mary Millard ’14, Naima Qambi ’15, and Mallory Ward ’15) in a new course in 2013-14, Psychology 314: History of Psychology, conducted research in the Muskie Archives at Bates and online in order to create the timeline. In subsequent years, students in the class will continue the timeline, concentrating on the years following the Department’s move into Pettengill Hall. If you have stories or photographs to contribute about those years, please get in touch with Professor Georgia Nigro (gnigro@bates.edu).